Solution for messy cables, Integrates 7 different cables (monitor, keyboard, mouse, speaker, microphone, and USB) ONLY WHILE STOCKS LAST! The elegant solution for messy cables, the PE100 OctoLink Cable integrates 7 different cables for peripherals (monitor, keyboard, mouse, speaker, microphone and 2 USBs) into a single cable for PC or Mac. Easily connect and disconnect peripherals and unclutter your desk with peripherals out of the way. 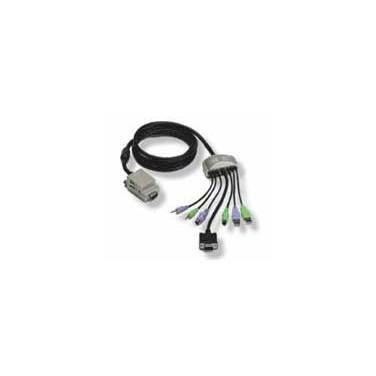 Coaxial VGA cabling enhances your computer screen’s image quality and Ferrite Bead reduces electromagnetic and radio frequency interference. Strain-relief moulding increases durability while double shielding and PVC over-moulding prevent loss of data.